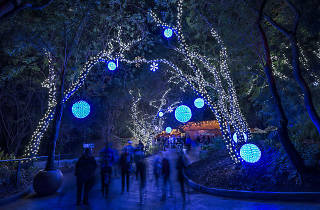 Skip the lines at LA Zoo Lights and grab a few drinks with this adults-only VIP ticket. Gather at the base of the sculpture to picnic, eat free cake and wish the '70s installation a happy birthday. Feel as though you've escaped to a small-town fishing village at this illuminated boat parade and fireworks show. Belt out Christmas classics at this free public celebration. Gather up your friends and family to hear more than 20 choirs, music ensembles and dance troupes from all over the city. Usher in 2016 with thousands of other Angelenos as a countdown clock is projected onto City Hall. 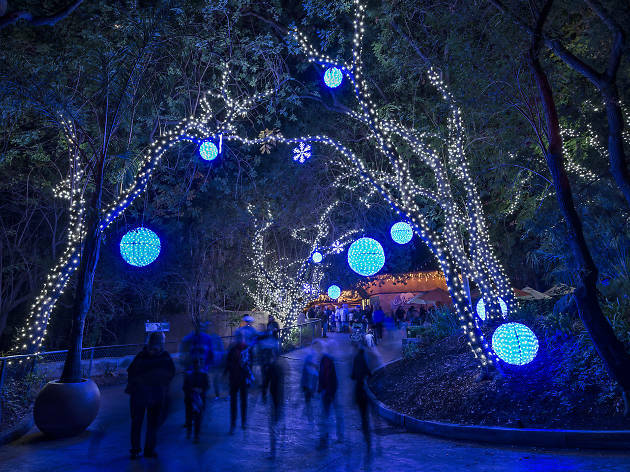 Find more things to do in our December 2015 events calendar. Say goodbye to your ‘stache with a free shave—and a farewell shot—for a celebratory end to Movember. Learn how to make three fantastic seasonal cocktails at this festive workshop while listening to the requisite holiday tunes (ugly sweaters encouraged!). Celebrate the end of Prohibition at this Downtown Arts District brewery—just be sure to don your best 1930s garb before enjoying specialty flights of beer. Indulge in all your cheesy fantasies with our first ever Mac & Cheese Smackdown, featuring nine of the city’s best mac dishes plus beer and wine. Cheers to the holiday season at this annual Westside tradition, when you can belt out Christmas carols while drinking your way through Santa Monica. Celebrate female comedians with sketch group Cake Batter during this annual comedy fest. Step into the Echo Park installation space's basement as it transforms into a sports bar-themed art gallery. Sit down for a campy musical send-up of Home Alone, just in time for the film's 25th anniversary. Catch the final performance and three year anniversary celebration of this monthly variety show. See Los Angeles and other cities from more than 5,000 feet above at this photo exhibition. Listen to the exceedingly talented and dynamic violinist perform classical and contemporary pieces. Celebrate the holiday season with an art sale and open house at the 30 galleries in this Santa Monica arts complex. Get into the holiday spirit with this mischievous classic at Laemmle’s Throwback Thursday. John Carpenter, Kurt Russell and over-the-top ‘80s fantasy? Sign us up for this cult classic. See the latest entry in the sci-fi saga as theaters across LA screen it a little bit early. Find more movies in our picks for this week's best film events. Cake on the eyeliner for the one year anniversary of this emo dance party, complete with Dashboard Confessional and Mark Hoppus. Check out this gravelly San Francisco rock duo’s blend of echoing drums and rich guitar in Santa Ana. Catch the British band's theatrical, awe-inspiring stadium-sized live show. Hear the man behind 2011’s “No Diggity” cover perform his soulful R&B at the Observatory. Find more shows in our December 2015 concert calendar. Get into the holiday spirit with this classic Christmas tale. Relive your childhood theatergoing experiences with Uncle Drosselmeyer, Clara and her beloved nutcracker. Catch this high-flying, steampunk-themed Cirque du Soleil touring show when it arrives in LA. Hip-hopping penguins, dancing Santas—who’d want to miss that? See the best-selling novel about a whirlwind romance come to life on stage. Hear three Latina comedians tell stories of past Christmases as first-generation Americans. Listen to Idina Menzel's legendary pipes in this musical about what-ifs. Amp up your holiday shopping game with a neighborhood-wide block party from Northern Grade and Parachute Market. Gear up for the holiday season at this annual holiday market in Old Town. Rub elbows with local artisans at this high-end, handmade market. Look for wow-factor gifts over a glass of champagne in a heavenly Hollywood home. Spend two weekends stocking up on presents at these Downtown markets. Finish up your holiday shopping at one of the country’s best craft fairs—and enter to win a $1,550 gift basket on us! Reserve the second weekend in December for the holiday installment of this Pinterester's Utopia. Shop more than 50 of the top vintage retailers, both local and national, at this stylish market.